The castle, on three levels, which originally dated from the XIIth century, was extended during the XVIIth century, and then restored entirely in 2012. 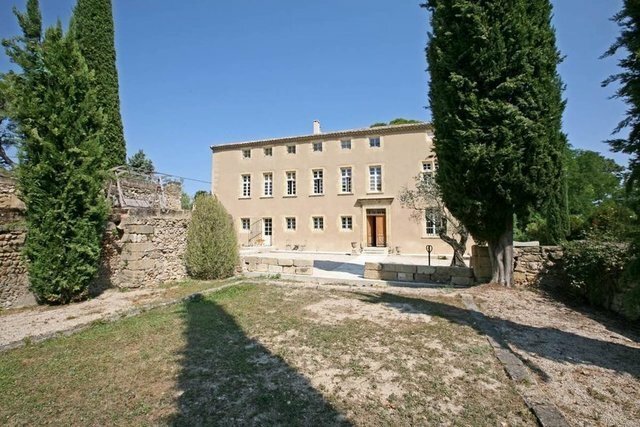 In the heart of a private estate of almost 3 hectares, with caretaker's house, guest apartment, swimming pool, boxes and enclosure for horses.On the southern front wall of the property, there are elements from the medieval period such as stone frames, mullioned window, remains of an old watchtower. Great space and high ceilings on the first two levels. On the ground floor, there is an entrance hall with access to a large reception room on the left which covers the entire depth of the building, and on the right, several rooms in a row, one of which is a dining room, a former kitchen (many large stone elements), a current kitchen, a scullery, and several technical rooms. At the end of the hall, a staircase and a wc, then rooms in a row, a large vaulted room with a beautiful fireplace. On the first floor, there is a master suite with a living room which opens onto a bedroom, a bathroom, and a walk-in wardrobe, a sauna and a toilet on one side, and on the other side opens onto a large study (could be a spare bedroom). On the first floor still, a large library room, another bedroom, a shower room and a toilet. On the second floor, there is a very large apartment (uses almost the entire floor) with an open plan kitchen and large living area, two bedrooms, a shower room and a bathroom. At the rear of the building, a large double garage and two technical rooms, one of which with all three (recent) boilers for the house.To the south of the building, several landscaped areas, terraces, pond and pool. At the level of the south entrance majestic gate, a caretakers's house. Close to the north entrance, old stables converted into an independent apartment, and various garages. Finally, the entrance to the west leads to a beautiful alley, bordered by tall trees, leading to the castle.